There was no reason as to why these jerseys were released. They were simply referred to as Warriors Special jerseys. Most collectors refer to them as the Warriors hoop jersey. These may have been worn in the trial game against the Panthers in Invercargill but I have no evidence to confirm that yet. OFFICIAL REPLICA - These were made in a very limited run. I was told there were only some 100 made and they sold out in one weekend. They only arrived the day before the game was to be played. A portion of these jerseys were given to sponsors and corporate box owners while some 25-30 were turned into players jerseys. 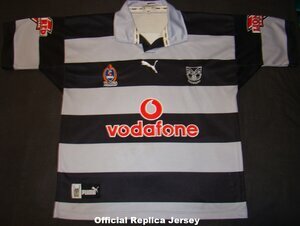 As a result these are quite a hard jersey to get and highly desirable by collectors. 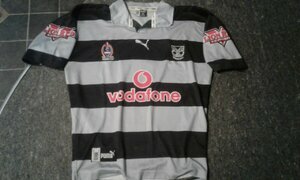 Even jerseys in not so good condition do well as far as prices go. They get around $150-$200 regardless of condition (within reason!). A signed one with tags still attached went for almost $600 in 2013. 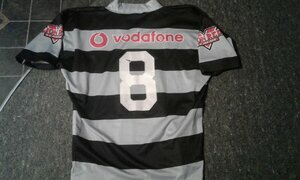 PLAYERS JERSEYS - Only worn for one official NRL game than used as a training jersey for a couple years. 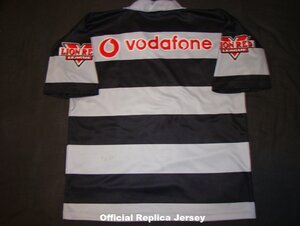 They werent tapered and were basically the replica jersey with a number on the back. After Puma stopped being the official sponsor of the club the jerseys were given away to players and staff members.